One of our Rad sponsors is Hero Forge! 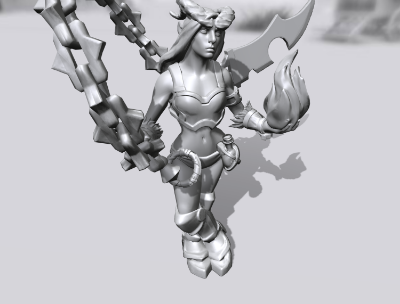 http://HeroForge.com. These guys are producing printed figures that (after having painted them) i can honestly say are REALLY AWESOME. I was surprised at the amount of detail they were able to get! The best part is that you get to design your own mini using their Design Software on the website. Printed figures come in different materials & Sizes! "Hero Forge is thrilled to be able to offer something to Reach Out and Read, Inc. We're passionate about tabletop gaming and storytelling, and encouraging literacy at a young age is one of best ways to provide children with the keys to new, inspiring stories and thrilling, alien worlds. And, of course, beyond literal fun and games, literacy provides the essential foundation for success later in life. Projects like the Celebrity D&D game are especially close to our hearts. Gaming has played an important role in so many children's development and flourishing (especially true for us, the founders of Hero Forge), so it seems only natural to further catalyze it to do good. We expect nothing but the greatest of success for the project this year and in years to come, measured in improved lives and new opportunities. -Joshua Bennett, Co-Founder of Hero Forge"
Thank you thank you So much guys! They Really turned out so good! Very impressive! Design was easy AND Fast and you can save Multiple characters for future editing! Here's the series they sent me. 4 of our Characters. And here's a gallery with the painted sets! A big thanks to Tim Regan & Christine Wu who came over and helped paint them.